In today’s digitally-driven job market, it’s more important than ever to build a strong personal brand presence that communicates your story across all relevant social and online profiles. And your personal brand isn’t limited to just the online space – it also includes your resume, cover letter, and any other materials you might be using in your job search. The idea is that your personal brand is a cohesive portfolio of materials a candidate can use to market themselves to a particular audience and create visibility in a saturated job market. 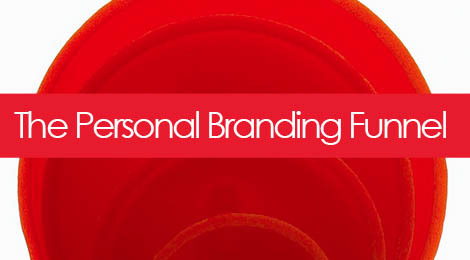 Building a strong personal brand begins with something called the “branding funnel” – which illustrates the different pieces of the brand building process, and how they influence and connect to one another. 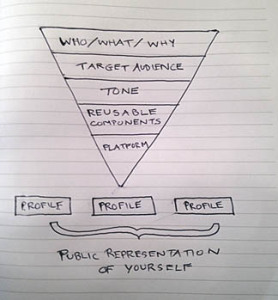 The idea is that any public representation of yourself that you put out there on any platform is influenced by this process, which you really only need to do once unless you have multiple areas of focus you’re pursuing or multiple audiences. Each step leads to the next to help you make informed decisions. The starting point is essentially answering the primary questions that drive your job search, and your brand identity: Who are you? What do you do? Why do you do it/is it important? This is the core of your brand message, what you want your audience to know and retain about you. We’ve spoken before about how you need to have a defined target audience to whom you are trying to appeal in your search, whether it’s the CEO, the departmental decision maker, such as a Creative Director, or the hiring manager. Once you understand the Who/What/Why you can tailor your brand message to speak to the appropriate audience. Knowing who your audience is will then determine what tone of voice your personal brand should have. Are you trying to convey a more creative, edgy appeal, or would your audience relate better to a more professional, corporate style of communication? Now you can start to craft the different components of your personal brand around your branding message, your target audience, and your desired tone. The basic components I cover in the course include things like an impactful headline, a long and short-form summary or mini-bio, and visual elements such as a profile photo or logo. The idea is to create a consistent library of content that you can go back to adapt and adapt to fit multiple platforms. Now that you have your content, you need to use the information you have to determine which platforms are most appropriate for building out and carrying your personal brand message. Is it social media, LinkedIn, a personal website? Think about your target audience, where they’re apt to be looking for or engaging with you, and what will appeal to them. Every public representation of your brand should be consistent and built upon intentional design decisions, wherein each step is validated by the last. This is the user experience end of it, and it relates just as much to building out your own brand, as it does to building a Fortune 500. This will help you not only establish your personal brand presence, but also provide you with a method to self-evaluate as you make changes moving forward. Your brand is both a deep reflection of you (what you do, what you care about, etc. ), as well as a flexible strategy to guide you through your job search marketing efforts. Let us know how we can help. Tags: branding, career, job search, LinkedIn, marketing, personal branding, shameless self promotion, social media. Bookmark the permalink.